Late summer is filled with garden fresh foods and other farm products at the farmers' market. Fill your belly with the freshness of the season, while foods are perfectly ripe and at their most flavorful. Ask your favorite farmer how he or she likes to prepare a food, and you will find that they often have recipes with simple, flavorful ingredients that are in season. David Venable is a host on QVC, offering the best in southern homestyle, decadent treats. He shared a few favorite recipes with Foodista, the first being this classic side dish that features sweet corn. 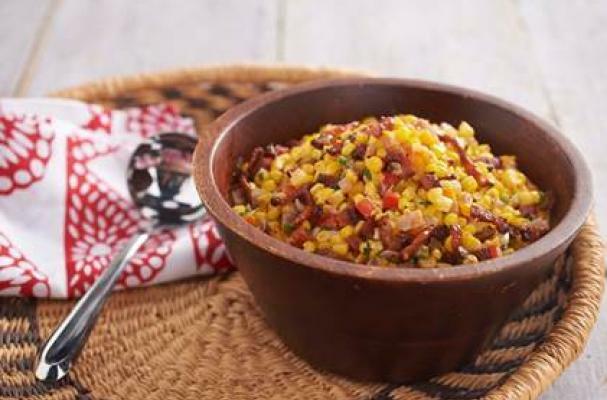 Corn Maque Choux, or smothered corn, is a traditional southern dish that is like succotash, containing all the fresh things right from the garden: corn, peppers, onions, scallions, lavored with plenty of bacon and cream, it's salty, creamy and naturally sweet. You won't be able to stop at one bite. In a large skillet, cook the diced bacon until crispy. Drain and let cool, reserving 2 Tbsp of the bacon grease. In a large skillet over medium heat, place the bacon grease, red and yellow peppers, red onion, thyme, and jalapeño. Sauté until the vegetables begin to soften, but do not brown. Add the corn, scallions, and Cajun seasoning. Continue cooking to soften the corn. Add the heavy cream, then stir and simmer for about 5 minutes. Stir in the cooked bacon, parsley, basil, butter, salt, and pepper. Serve while hot.